Mama and son get cute in the kitchen. We're saying farewell to Summer and finally ready to face new routines over here. We can't wait to share all our new friends and neighbors with you. This week, we visit marketing maven, Sarah Barkawi of Honey Agency and her curly-topped tot, Zain Oliver in Midtown Sac's Poverty Ridge (a stones-throw from Racks Vintage). Scarlet-lipped and bubbly, Sarah opened up the doors of her sweet California bungalow to Celisse Muller's lens, introducing us to her vast collection of local-art, pieces of her Palestinian heritage, and impressive succulent compilation while her darling little guy entertained us on the porch. Click for more of the curated home chalk-full of stylish finds and family love. Sarah and her family recently bought the cute craftsman bungalow in Poverty Ridge. A meditation on the concept of Home, by Carson Ellis. 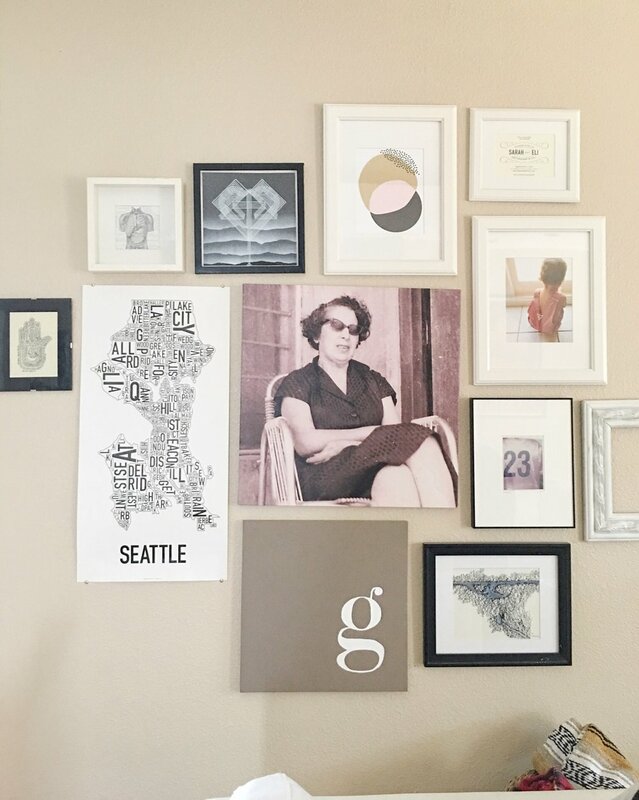 Gallery Wall: Middle photo printed on canvas of Sarah's late grandmother, Teta Mimi. (Teta is grandmother in Arabic), a piece from the talented local artist, Jose Di Gregorio that he gifted to Sarah as a wedding present, G painted by Sarah. One of the couple's first home purchases: a West Elm light fixture sets the tone. Lovebirds! A photograph of Sarah's parents at their high-school prom in Palestine. The "sweetest and most challenging moments" lived here on this rocking chair. Fresh laurel sprigs in the kitchen. 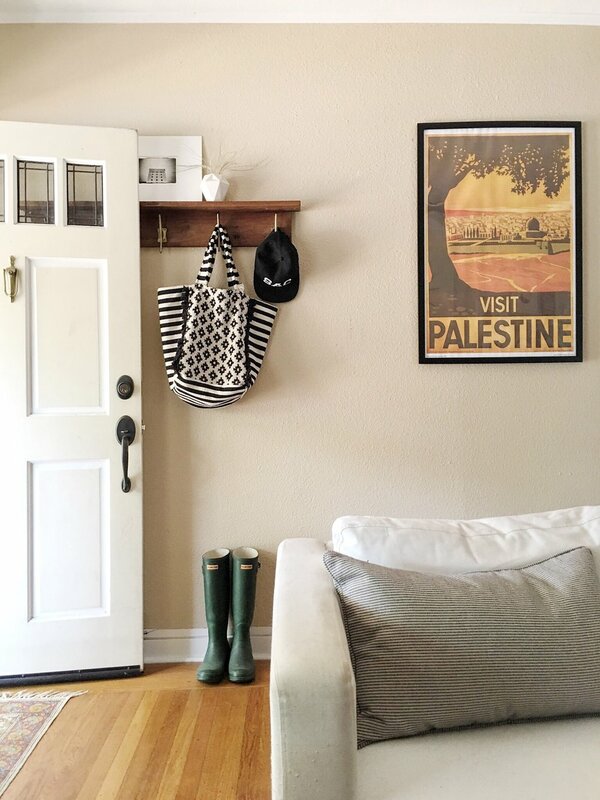 This world-traveler has planted her roots here in California. Print from local Plant Foundry. Wedding vows clipped on the fridge. Cutting board by neighbor, Nils of Newtown Booth Bevelworks and mobile by former ma crush, Sarah of Electric Sun Creatives. Custom stool found on Etsy, and Sarah's go-to gift for the tiny humans in her life. Zane and Sarah's mother, the best of friends. Handmade quilt by two local artists, Two Accordions. Nursery art painted by PS friend and Old Gold co-owner, Trisha Rhomberg. Modern mobile, made with love by Sarah's husband. Boatloads of succulents left over from the couple's wedding ceremony.